Delete a useless icon on screen, sorry! A simple alarm clock reminder software . Single interface , quick start . 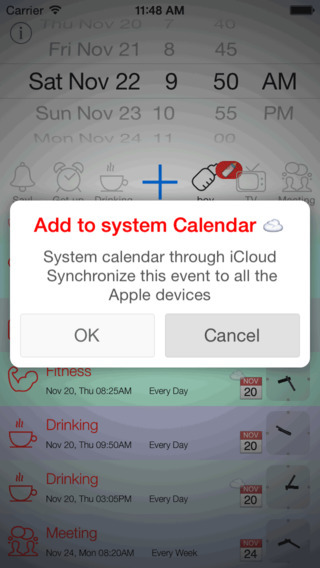 Synchronized to the system calendar with iCloud. Select the default alert icon matters , but also the keyboard to enter information. Provide more matter to change the default icon . Daily Weekly Monthly repeated reminders. When the program exits , but also alarm sound at the specified time , Special ringtones , and specify text messages. There are digital alarm clock icon marks tips , suggesting not timed events.